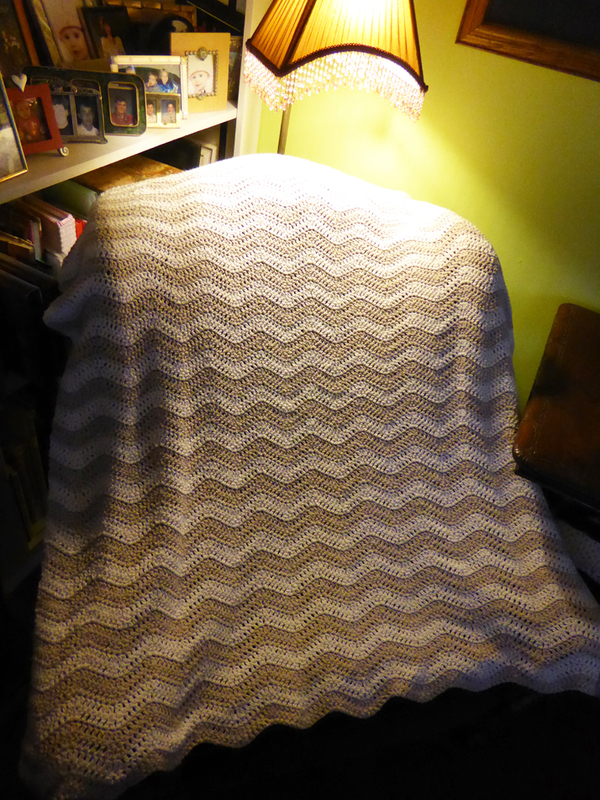 It's hard to find a good place to photograph a blanket..
Over the chair in the dark living room. Then I cleared off the dining table and spread it out. 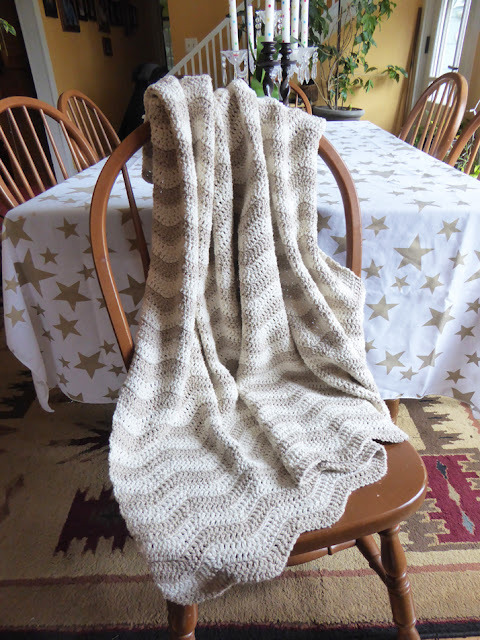 This is the neat ripple pattern by Lucy at Attic24 blog - her free patterns are on her sidebar. I like it better than the pointier ripple I learned when younger. It's more organic and smooth. I used Premier Home cotton blend - 85% cotton 15% polyester for a more long-lasting product. I really do like the look and feel of cotton. I used these two natural colors as I wanted it to fit in any color scheme or decor that my niece and her husband choose for their home. I am happy this is done so I can move on to other UFO's and WIPs (unfinished objects and works in progress). :-) Now to get it boxed up and shipped! Teresa the blanket turned out just beautiful!! Those colors are wonderful together and as you say, it will work well with any decor. I know they will be so happy to get it. I like that Buddy seems to have claimed it for his own. He's probably spent many cozy evenings on your lap underneath the blanket as you worked on it right? I hope you have a wonderful weekend my sweet friend. Stay warm now that your blanket is done and off of your lap! That is just beautiful! I have one precisely like it, though much smaller, and I love it. No doubt the new couple will cherish it. It's beautiful Teresa! They will love it and always think of you! I am itching to do another blanket!! Gorgeous project Teresa! What a special gift!! I'm crocheting the edging on my ripple--almost done, finally! It really is beautiful, it is sure to become a treasured heirloom. The colour choices are perfect to go with any décor so the perfect gift. Take care. Beautiful blanket Teresa!!!!!!!!!! !Have a nice day my friend!!!!Kisses!! Just lovely Teresa..may I ask did you use cream and beige from Premier Home Cotton? Yes, those are the two colors I used. That cotton is very cost friendly! Just lovely Teresa...may I ask, did you use cream and beige from Premier Home Cotton? Toutes mes félicitations. Bravo ! 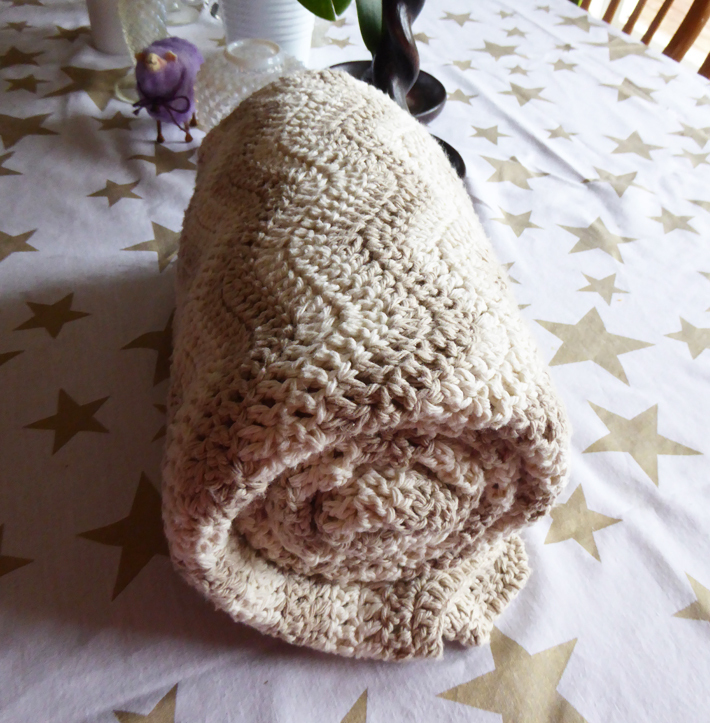 A marvelous blanket for a young couple made with much love and empowered. It's beautiful and very serene looking. I'm sure your niece and hubby will love it. Makes me realize that as we sit and crochet night after night, with our kitty or beloved doggie by our side, usually sitting on some part of it, that they will probably miss it when it's gone! Makes me also think we should crochet a little blanket just for our kitty or doggie, so that when it's done, it's THEIRS and they can enjoy it for years to come! I think I may do that for my new kitten.. she always wants to sit ON the yarn so I'd better make her her own little blankie. My nephew is getting married in May.. do I have time to make a ripple blanket? I've never made one, but love how it "flows". A beautiful crochet blanket. I dp love your colour choice. It looks so soft. Shirley N.Z. Your blanket came out just lovely! Those colors will match all their houses throughout their lifetime. I also like how this ripple design is solid and does not have holes at the top of the points. So pretty! nice blanket and I like the colors. Not so good at getting some things finished. I'm getting a stab at clearing off my table and keeping up with papers....they are so annoying! Have a good weekend! Woohoo for finishing. That was a long project. I'm sure they'll appreciate it very much. Love it. Soothing colors that, you're right, should go anywhere. Congratulations on finishing a big project. It's a good feeling. I can sure appreciate the hard work and time that goes into making that sweet little blanket. I've been a professional hand knitter and sample maker for a few years and it is work ~ at times hard work to meet a deadline. But oh what a feeling of accomplishment to finally finish! Yeah!! And seeing Buddy's love for nice warm blankets is so cute. Love that Buddy! It's really beautiful. Well done on getting it finished. I finish projects but still have several in the making.